What if I told you could automate the growth of a Facebook Group using LinkedIn? Even the process of acquiring customers? Whether you’re working in software, high-ticket services, or e-commerce, this will work for you. 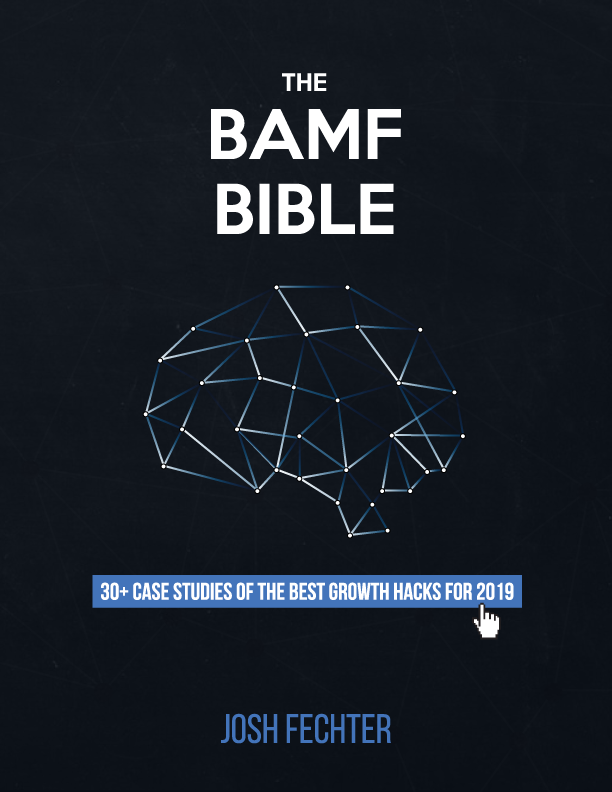 In this guide, you’ll learn how to automate rapport-building with your audience, get them to take action, then sell them on your product or services. 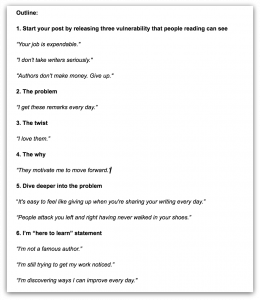 Once you’re done reading it, send it to your marketer so they can set this up for you or implement it yourself. A 2nd LinkedIn Profile is against LinkedIn’s Terms of service. 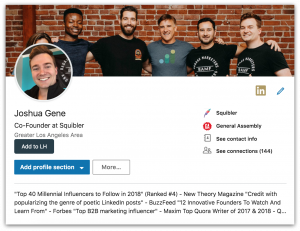 To avoid the LinkedIn police, don’t use the same name. Use a nickname. Now if it’s your actual profile, then it doesn’t matter. 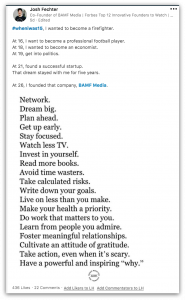 The reason you’d want to use the 2nd profile is if you’re starting a second company, have filled up the connections on your first profile, or want to just test this process out. Either way, you’ll need to start with optimizing your profile. Services include B2B growth hacking, PR hacking, chatbots, FB ads, SEM, growth strategy, personal brand management, and marketing automation. 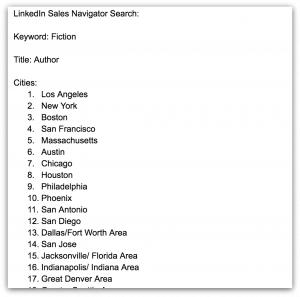 To connect to your target prospects on LinkedIn, get a Sales Navigator account. 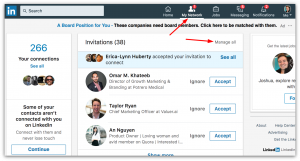 This will allow you to connect with your prospects at scale without getting banned by LinkedIn. Then download the Chrome extension, Linked Helper. 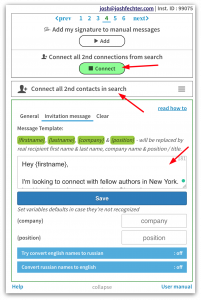 Next, use the Connect feature of Linked Helper to send 175 connect invites to your prospects every day. No more as you’ll get your account banned. The second important factor of not getting banned is keeping your sent requests under 1,600. To check if they’re under 1,600, click on My Network then Manage all. From here, click on Sent to see the number of sent requests you have. If you have over 1,600, then withdraw them by a hundred at a time. I’d wait several days without doing automation before withdrawing. The reason is not everyone is active on LinkedIn all the time so it may take them a couple of days to accept your request. Once you have requests automated and understand when to retract them, then you need to know who you’ll send them to. It’s easy to just plug-in your target prospect in Sales Navigator. You may get 10,000 results on the first try. Here’s the problem with this type of search: LinkedIn only allows you to hit 40 pages per a Search Query – that’s less than a 1000 people. So now you’re stuck with an extra 9,000 that’ll be hard to connect with. To solve this problem, split your prospects by city or state. This way you can connect to more of these individuals with better personalized messaging. For example, now you can include the city name in your message. This will increase the chances of them accepting. In the instructions I send to my virtual assistant, I use a Google Doc with the different cities I want to run search queries for. Now that you have the automation side down, the next step is to rock ‘n’ roll with an engaging content strategy. 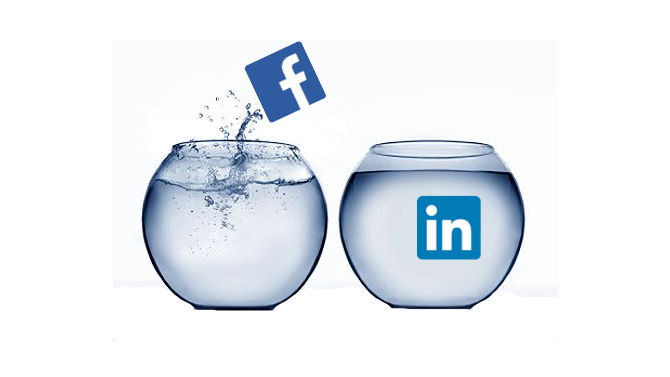 Niche-relevant pictures of quotes perform well on LinkedIn and in Facebook Groups. Depending on your niche, you can often find this content online already. For example, I want to connect with fiction authors at scale so I research influencers in the market whom they follow. 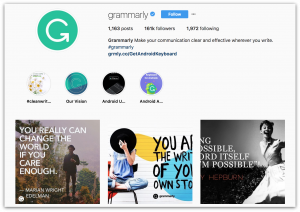 I find Grammarly and with further inspection, I notice they have a ton of content I can repurpose from their Instagram. I select the URL of each picture I want to use based on engagement and how relevant it is to my audience. I use the tool DownloadGram to get the PNG version of these pictures. Next, I ask a freelancer to remove all the Grammarly logos on the pictures and replace them with logos from our company. I do this because they’re pictures with quotes – not content to be taken seriously. I want the content to have variety, so I include long-form status posts. 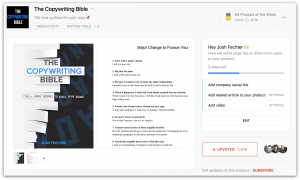 I take one of the hundred outlines from my Copywriting Bible book (entirely free), then change it up for the current audience I’m adding to my LinkedIn network. See how is that was? The next thing you need is a posting schedule. If you have 30 – 40 pictures and 100 viral outlines, then you have enough content for a year – at least. Feel free to adjust it according to your audience’s content preferences. Keep in mind, pictures still need great captions. A little something to provide context like the picture below. The caption doesn’t have to be directly related to the picture. As long as the message from the caption overlaps a little with the picture quote – you should be fine. Now you’re nurturing your audience. Once they know you and like you because of your content marketing skills, it’s time to reach out. Want to build a ton of rapport with your audience before you reach out to them? Here are a couple of easy ways. One is to have a virtual assistant find a positive article about each person’s company. It only takes a few seconds to plug-in the person’s name into Google News to pull up positive press pieces. 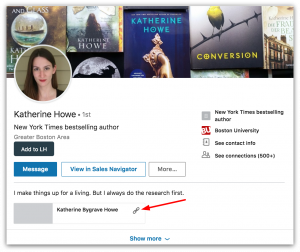 Even if you’re reaching out to authors who don’t work for companies, you can still include a note of personalization. In this case, I have a virtual assistant find one of the books they’ve written so I can include it in my personal note. They usually have the name of the book on their LinkedIn or, at least, a link to it. For example, this author has a link to their book on Amazon. You want to send these rapport messages through email to your prospects. LinkedIn messaging isn’t scalable if you want to hit thousands of connections because it’s far easier to get banned than using email. 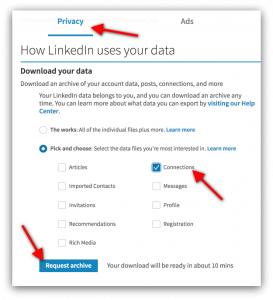 To get everyone’s email from your LinkedIn contact list, go to Settings & Privacy, then under Privacy select Connections and click Request archive. This will give you all their emails. Before you send out an email rapport campaign to them, upload the email list to Facebook Ads Manager as a custom audience so you can run ads to them on Facebook and Instagram. Ideally, the ads will be positive press pieces you’ve been mentioned in, testimonials, company culture stories, or clips from speaking engagements. Sometimes I’ll take one of the better performing LinkedIn posts I’ve written, then reuse that copy for an ad. 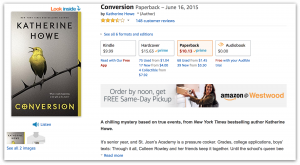 Here’s an example post below where I took the same copy, then use it for a Facebook ad with a different picture. Once you’ve hit your custom audience with creative ads several times over, it’s time to reach out via email. This way, once they get your email, they’ll have already seen your content on LinkedIn, Facebook, and Instagram. Understanding how to email prospects at scale is a crucial skill. It will enable you to kick-off your Facebook Group with – possibly – 3,000 plus members. Enough to make you look like a thought leader in your niche. Purchase three Mailshake accounts for sending bulk personalized emails with sequences. Sign-up for a Google Apps account and create six different email addresses tied to one or two domains. Start by sending out 20 emails/day from each account for the first week. Then bump it up to 50 the second week. Then you’ll be sending 150/day in the third week. Make sure to not overlap your email sending because you’ll be using sequences. This is a quick way to get banned. Create email sequences to join your Facebook Group. I noticed we’re connected LinkedIn. I came across this article about your company, [company name]. Great to see people in my network making a positive impact. That’s not to say a few people didn’t respond negatively to me. Out of every one hundred people I cold email, I get maybe one complaint. You need to write about your personal experiences and tie them into your audience’s profession. 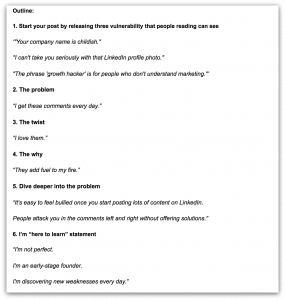 The secret: use the same strategy for LinkedIn content for your Facebook Group’s content. This way you never need to think about new content. Now you have a Facebook Group running at full speed. The best step you can take is to nurture influencer relationships in your niche by offering to interview them in front of your audience. This is an excellent way to build rapport with affiliates while gaining third-party credibility. From there, you’re off to the races on how you leverage your influence. Good luck. This was an excellent article, Josh. Any reason why a you wouldn’t do this with a Linkedin Group instead of a Facebook Group? I assume it has something to do with higher engagement at Facebook or the ability to leverage more data? Josh, as always, love readying your content. You’re clearly mastered growth hacking – while being genuine, personal, and interesting.